The history of punk music is possibly the most vibrant, exotic, brilliantly but seriously fucked up art form in the world of popular music. Whether that be the British punk explosion of the late 70’s, do it yourself skiffle and garage of the 1950’s and 60’s, art college performance as expressionism or the American nihilism of the east coast in the 1980’s; punk, as a genre has always been so much more than just a genre. It’s an act of rebellion, a literal two fingers stuck up in the face of comfortable and easy listening; its is noise terrorism of the most extreme forms. And, even better than that, it has a simplicity that allows anyone to get involved and shout out a message to the world. The Anglo-Italian mash up of a Yorkshire girl, in the cat mask, and an electroclash devotee, in the panda mask, from Rome, takes this ‘can do’ attitude to music and has created an album, called Party Animals, that plays like an absurd and surrealist comedy of senseless beauty. With simple melodies, seemingly played on a Casio keyboard, such as which were popular to kids now of a certain age, driven along by psychotically hypnotic drum beats Bikini Death Race sing songs of bewildering lyrical content, like a 21st century nonsense poem by Edward Lear, songs that scare and disturb with their deep black humour. This ain’t lullaby music for all its poetic lullaby qualities; well not unless you want to give baby nightmares. You can hear many influences in this album, but for me, most prevalent is the art punk glam rock of brothers Ron and Russell Mael, better known as Sparks. 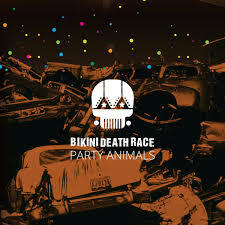 The catchiness of Bikini Death Races tunes ensnare the listener before, like Sparks, shocking and disturbing through its surreal lyrical make up. This is out there music, but out there is a place worth going with Party Animals playing in your ears.